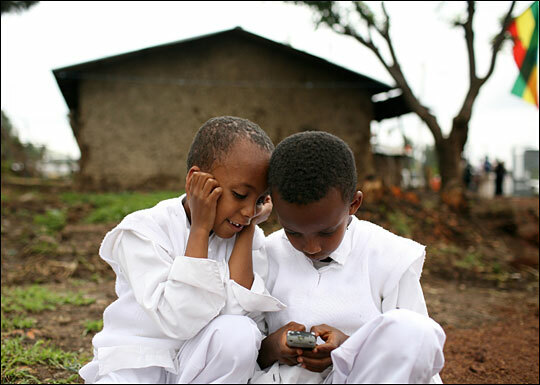 Children in in Debre Zeit, Ethiopia play with a phone in 2008. 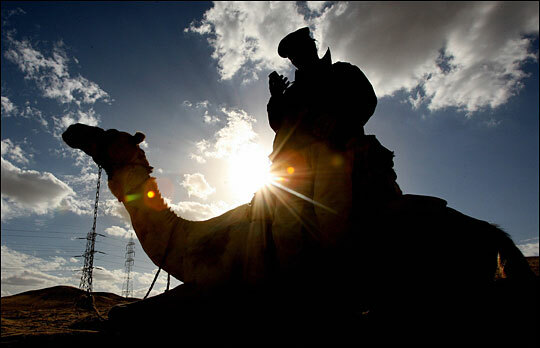 An Egyptian policeman on a camel uses his mobile phone during the 11th Pan Arab Games in Cairo in 2007. 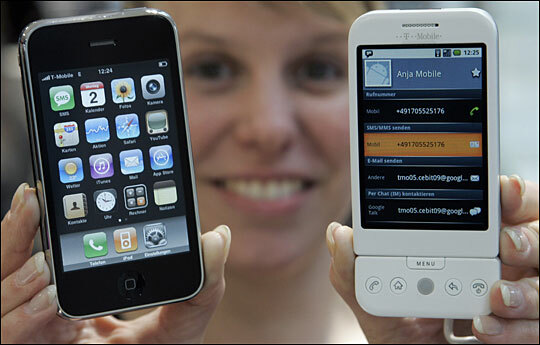 A woman presents the T-Mobile G1 (R) mobile device by Deutsche Telekom and the i-Phone 3G by Apple in March 2009 at the world's biggest high-tech fair, CeBIT in Hanover, central Germany. In Asia, Africa, Europe and elsewhere, cell phone technology has always been way ahead of what's available in the states. Around the world, people use their phones in innovative, creative ways. For example, mobile phones help rural farmers gather information about crop prices, and bargain shoppers download coupons on the fly. At the recent Mobile World Congress in Barcelona, LG unveiled a touch phone in a watch, and Sony Ericsson's new mobile phone (codenamed 'Idou') with a built-in 12.1 megapixel camera got plenty of attention. Also in Barcelona, Samsung showed its Blue Earth touchscreen phone. It's made from recycled water bottles, and has a solar panel that charges the battery. For this Talk of the World program, we're especially interested in hearing from our listeners abroad. If you live outside the U.S., tell us: In what innovative ways do you use your cellular phone? Natasha Elkington, journalist for Reuters. She uses her mobile phone to pay her farm manager in Kenya.